In this paper, we set out to develop a theoretical and conceptual framework for the new field of Radical Embodied Cognitive Neuroscience (cf. Chemero, 2009). This framework should be able to integrate insights from several relevant disciplines: theory on embodied cognition, ecological psychology, phenomenology, dynamical systems theory, and neurodynamics. We suggest that the main task of Radical Embodied Cognitive Neuroscience is to investigate the phenomenon of skilled intentionality from the perspective of the self-organization of the brain-body-environment system, while doing justice to the phenomenology of skilled action. In previous work, we have characterized skilled intentionality as the organism’s tendency towards an optimal grip on multiple relevant affordances simultaneously (Rietveld, 2012a/b/c). Affordances are possibilities for action provided by the environment (Gibson, 1979; Chemero, 2003). 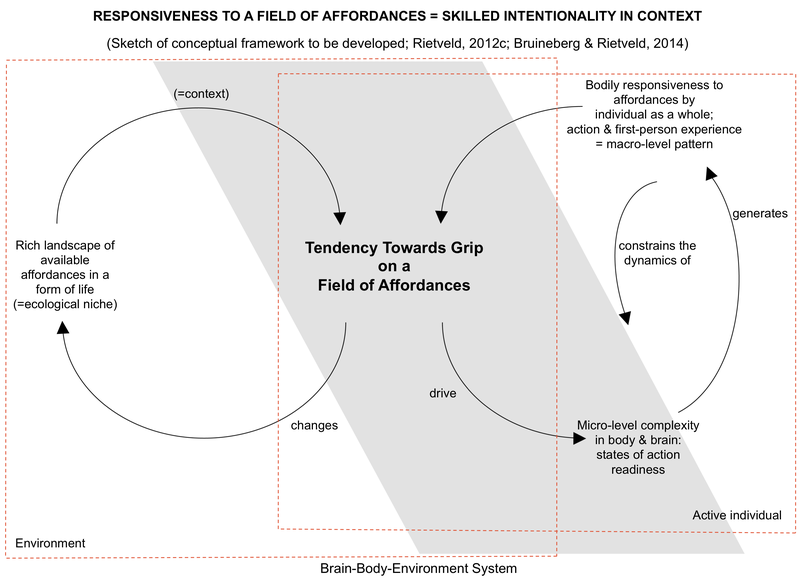 In the first part of this paper, we introduce the notion of skilled intentionality and the phenomenon of responsiveness to a field of relevant affordances. 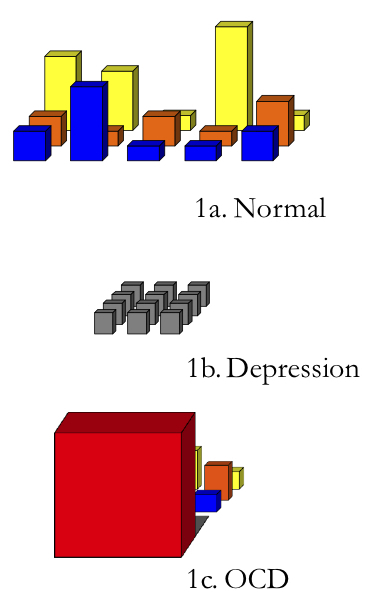 Figure 1: Sketch of conceptual framework to be refined (Rietveld, 2012c). Through skilled intentionality one gets a grip on a field of affordances. (Inspired by: Thompson, 2007, 2011; Chemero, 2003, 2009; Dreyfus, 2007; Tschacher & Haken, 2007; Rietveld, 2008a/b/c). Second, we use Friston’s (2000, 2011) work on neurodynamics, but embed a very minimal version of his Free Energy Principle in the ecological niche of the animal. Thus amended, this principle is helpful for understanding the embeddedness of neurodynamics within the dynamics of the brain-body-environment system. Next, we show how we can use this adjusted principle to understand the neurodynamics of selective openness to the environment: interacting action-readiness patterns at multiple timescales contribute to the organism’s selective openness to relevant affordances. In the final part of the paper, we emphasize the important role of metastable dynamics in both the brain and the brain-body-environment system for adequate affordance-responsiveness. We exemplify our integrative approach by presenting research (De Haan, Rietveld, Stokhof & Denys, 2013) on the impact of Deep Brain Stimulation on affordance responsiveness of OCD patients. One of my ongoing interests is visualizing the field of affordances. 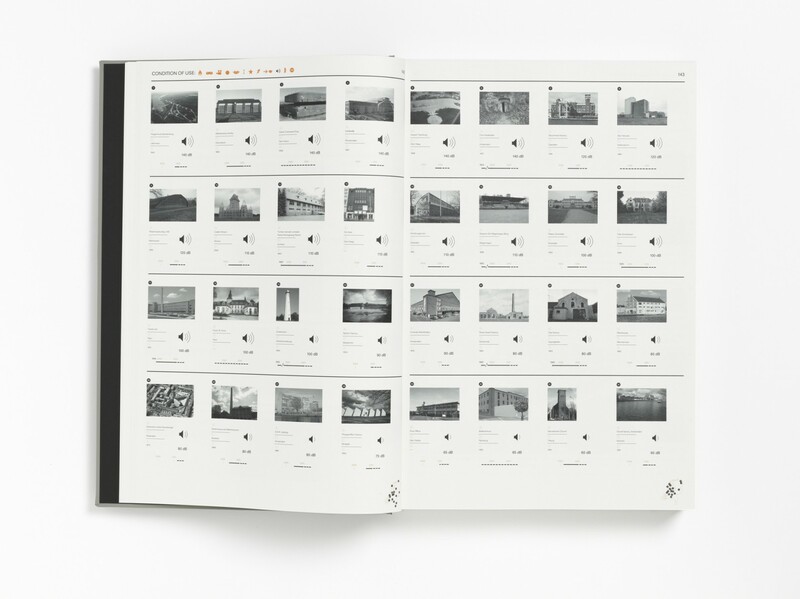 See for instance the Trusted Subcultures-project RAAAF presented at the Sao Paulo Biennale 2009, using social affordances to create new public domain for the centuries old water city of Amsterdam. Or, more recently, our project Outstanding Landscape of Affordances. 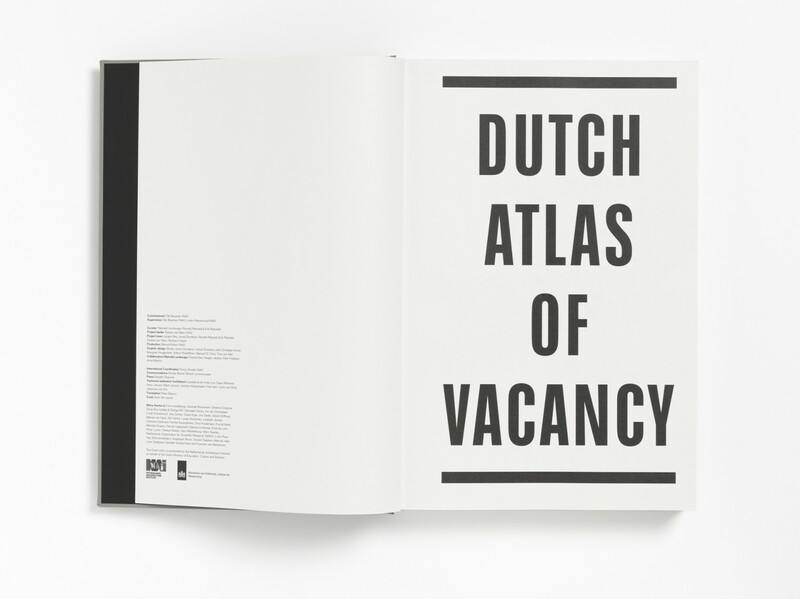 Another example is the Dutch Atlas of Vacancy in which we investigated the affordances (in context) of 10.000 empty public builldings in the Netherlands. For instance the possibilities for making noise: at a vacant air base or in a vacant bunker one can make sounds of 140DB without disturbing anyone. In a new special issue on Neurophenomenology edited by Evan Thompson for Frontiers, Sanneke de Haan, Martin Stokhof, Damiaan Denys and I have now published a more abstract sketch of different fields of affordances. We propose that the changed world as described by the 18 OCD patients with Deep Brain Stimulation interviewed by us at the Academic Medical Center can be fleshed out in terms of changes in their field of relevant affordances. We can distinguish three dimensions to this field: the “width” refers to the broadness of the scope of affordances that one perceives. This dimension relates to having a choice or action options. The “depth” of the field refers to the temporal aspect: one not only perceives the affordances that are immediately present here and now, but one is also pre-reflectively aware of future plans and possibilities for action: the affordances on the horizon that one is responsive to, so to speak. 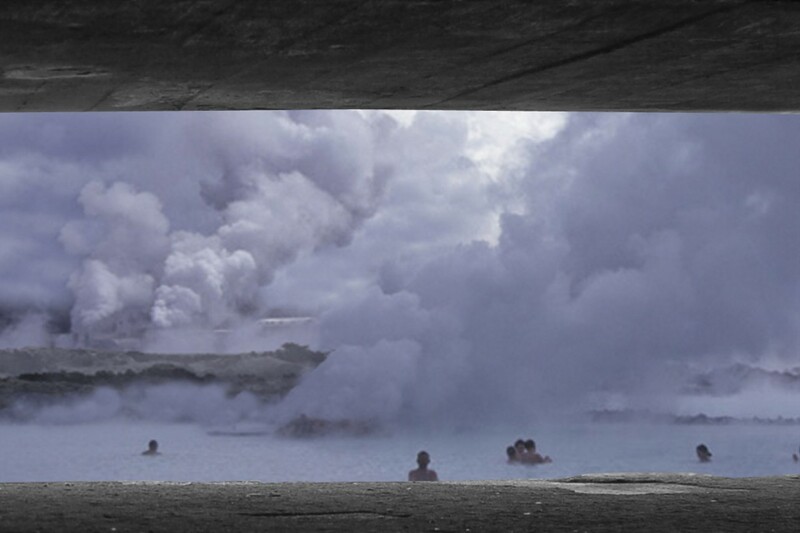 This temporal horizon reflects our anticipatory affordance-responsiveness. Lastly, the “height” of each of the affordances refers to the relevance or importance of the affordances that one is responsive to, i.e., to the experienced solicitation or affective allure. This dimension of relevance and salience relates to the motivational force of affordances. The title of our (open access) article is: The phenomenology of deep brain stimulation-induced changes in OCD: An enactive affordance-based model. Soon the Gerrit Rietveld Academy and the Sandberg art academies will get a new building and outside space. The students from the departments Fashion, Dirty Art and Photography will contribute to the new design by investigating the following question: What makes a place a good place? The existing main entrance of the Gerrit Rietveld Academy is an example of well functioning public domain. A place were people from different backgrounds can meet and sometimes do meet: students and teachers from different departments, people from Sandberg and Rietveld. During the first week of November interdisciplinary groups of students will investigate the way the environment contributes to such opportunities to meet. Starting from their own fascinations and skills, student from the three departments will make proposals for new possibilities for social interaction in between the existing and the new building. If the square/entrance could be 100% fashion, photography or dirty art, how would you design it? How would your ideal work space on the terrain look? What would be your most daring intervention to connect physically the worlds of Rietveld and Sandberg? Last Friday the Dutch Psychiatry & Philosophy Foundation has awarded my chapter with a prize for the best contribution to the Dutch Handbook Psychiatry & Philosophy. In my opinion this award confirms the potential of the new field of translational embodied cognition. De Haan, S, Rietveld, E. & Denys, D. (forthcoming), Being free by losing control: What Obsessive-Compulsive Disorder can tell us about free will. In Glannon, W. (ed.) Neuroscientific and Philosophical Perspectives on Free Will. Cambridge: Cambridge University Press.